Most people do not realize that timing plays an important role as far as finding the right job is concerned. To give your job search an edge, it helps to understand the yearly recruitment cycles of the industries and recruiters. Although every industry has its own hiring season, you can observe a general, predictable pattern across the country. If you’re aware of when companies are likely to be hiring, you could increase your odds of getting a job, reducing frustration during the job hunt. The specialists at our job placement agency perform extensive research to help connect the employees looking for job opportunities with the right position and company. Here are the quarterly details of the recruitment cycle in Canada along with the hiring dynamics. The first three months of the year are usually considered to be rewarding as far as employment opportunities are concerned. With the beginning of a new year, people are looking for a new job, and recruiters are also looking for potential employees. 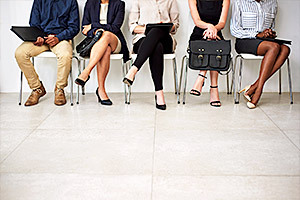 With many companies wanting to get a jump on finding the best candidates, it is the perfect season for people looking for jobs. It also allows new hires time to get on board, learn the ins and outs of the position, and get trained before business picks up. With seasonal businesses picking up their pace during spring, this is the peak hiring season in Canada. The hospitality and tourism industries provide excellent job opportunities, and companies usually rush to fill positions during these months before summer vacation commences. July through September is less active regarding new career possibilities and job openings. However, for those with an impressive employment background, these slow hiring months can be an advantage because this is the time when recruiters are often willing to take a detailed look at an experienced candidate and consider them for a job. With a mix of fall activities, festive seasons such as Thanksgiving and Christmas, and maneuvering the end of the financial year, these months display the most complex hiring dynamics. In addition to this, the cold climate in Canada affects many industries such as construction and mining. This does not necessarily mean that you have to wait till the end of December to look for work, however, as many recruiters and industries are often prepared to fill the year’s remaining openings before the beginning of the new one. The job search process can be time-consuming with no guarantee of finding the right position. This can become further magnified with seasonal factors influencing job hiring prospects. A staffing agency can help you find the perfect position. With over 40 years of experience in the field, Winters Technical Staffing has the resources to help you launch or advance in your career. We offer staffing solutions across Canada and specialize in many industries. For more information about our services or to discuss your staffing needs, reach out to our recruiting consultants by calling 647-556-2408. You could also fill out our online form to schedule a complimentary consultation.